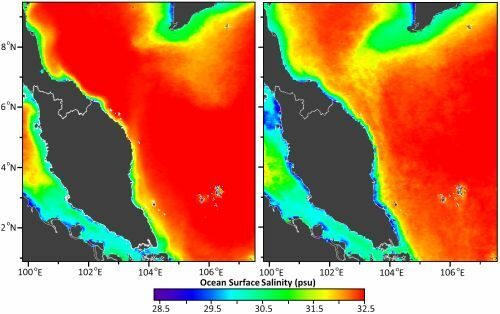 Selangor, Malaysia, Feb 19, 2018 - (ACN Newswire) - Measuring salinity at the ocean's surface is important for tracking global ocean circulation as well as local ecosystem health. A research team from Universiti Malaysia Terengganu have proposed a new method to measure sea surface salinity using ocean colour as a proxy. Reported in the Pertanika Journal of Science & Technology, this method could improve monitoring frequency and resolution, particularly for coastal areas. Salinity is the concentration of salt ions in a volume of water. While the total salt content of the ocean remains fairly stable, salinity can vary as the ocean's volume changes when fresh rain, river water and melted ice enter the ocean, and when seawater freezes or evaporates. Some areas get saltier and others fresher as these processes occur, collectively known as 'the hydrological cycle'. Besides affecting marine organisms, salinity is also a key player in ocean circulation. Saltier, denser water sinks beneath lighter, fresher water, helping drive the massive conveyer belt carrying seawater around the world. A space-based satellite currently measures sea surface salinity all over the globe using a metric called 'microwave emissivity'. The Aquarius satellite, operated by the U.S. National Aeronautics and Space Association (NASA), takes one measurement for every 150 square kilometres of ice-free ocean, passing over the same spot once a week. Marine scientist Md Idris Suffian and colleagues wondered if they could use images taken from another pair of satellites that cover the entire ocean daily, and on a much more detailed scale - one picture for every one square kilometre. To do this, they needed to confirm that they could use ocean colour captured in the optical images to determine salinity. Ocean colour is partly determined by how much organic matter is dissolved in the water, which gives it a green, yellow or brown tint, rather than the usual blue. By testing seawater samples taken along the east coast of Malaysia during different seasons, the researchers found a reliable inverse relationship between the amount of coloured dissolved organic matter (CDOM) and salinity. Based on this relationship, they were able to develop a mathematical algorithm that could be used with the satellite images to derive salinity. They use the colour data captured in the images, specifically in the deep blue part of the spectrum, to determine the amount of organic matter, and then compute salinity. The researchers note, however, that the performance of the algorithm may vary from region to region, depending on the degree of mixing between freshwater and seawater. Especially in areas with heavy river flows and high levels of organic material, the conservative relationship between dissolved organic matter and salinity could be altered so much that it no longer fits the algorithm. They recommend further testing to improve the algorithm.